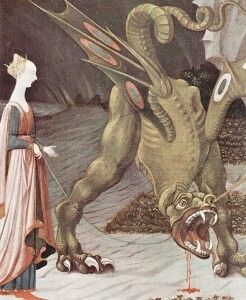 The feminine turns into a lioness, slays the dragon Thou Shalt, and proceeds to write a new story. Just to get on with things, let’s assume that there was some justification for the roles imposed on women early in history. At the same time, let’s agree that such justification expired—last year. Perhaps that is the real significance of the Fifth World, which began on December 21, 2012, according to the Mayan Calendar. Let us imagine for a moment that it signified the empowered feminine beginning to move toward center stage. If enough of us can envision this, it will become true. I have always been fascinated by history but only began to study it with kind of a feminist eye when I entered into a marriage with stepchildren. My interest deepened as my role within the family became increasingly traditional in shape. I had nothing serious to complain about; I just began to feel like the camel described by German philosopher Friedrich Nietzsche. I have not studied this gentleman, but I discovered an apt metaphor in his writing while reading the great mythologist Joseph Campbell. Midlife, according to Nietzsche, is ideally a time of realizing your soul’s purpose. At this point, as Campbell describes it, the camel is well-loaded, gets on its feet, and goes out into the desert and turns into a lion. The camel’s purpose now is to kill the dragon Thou Shalt. This is a lot of animal lore, but the symbolism certainly applies to my own decision to go my separate way after eighteen years of marriage. A sense of purpose generated new duties and responsibilities, but I was more comfortable at the helm of my life than taking orders on deck. The ensuing time has been challenging but very rich, and I wonder: Could a massive movement by women toward the helm of life introduce a new age in history? As the patriarchy became ever more controlling beginning in about 1000 BCE, the fact that the story of humanity is half feminine seemed irrelevant. The effort over thousands of years to keep women ignorant, to discourage intellectual development and creativity, and to numb spirit with disdain and the most menial of tasks, has been like creating and enforcing disability. As a result, instead of benefiting from the enormous and at least equal potential of the feminine mind, civilization has been largely deprived of its gifts. I once heard of a man who always drove a powerful sports car well below the speed limit and walked his Great Dane tight against his thigh. He was obsessed with power restrained. The history of civilization has been like that, half our rpms untapped. We could consign those circumstances to the past, however, and commit to fully accessing feminine capacity. This would involve taking Nietzsche’s concept of the ages of individual life and applying it to humanity as a whole. The feminine is now “up.” Metaphorically weighted like a camel with unjust burdens, she turns into a lioness, slays the dragon Thou Shalt, and proceeds to write a new story. In the issue of National Geographic that provoked this discussion, a woman explorer was highlighted. Gerlinde Kaltenbrunner, a 42-year-old Austrian, is the first woman in history to climb all fourteen of the world’s 8,000-plus-meter peaks without oxygen. Her camel time was spent as a nurse, but she slayed the dragon in 2003 and became a professional mountaineer. Kaltenbrunner is an example of the exceptional women among us who can do almost anything and go anywhere. Why should we encourage this? When women are participating everywhere, we will discover the things that we urgently need to change to restore balance to the world. Ellen – thank you for this! I am sending it on to my two daughters as well! You are a beautiful writer and thinker!! What a magnificent treatise you have written. You are exceptional!! Tears come to my eyes when I look at my life (almost 70 years of it) in terms of these three points to nurture. I feel proud of myself, I hope my inner self can begin to feel that pride.